Champions for Children Luncheon Raises More than $380,000! Celebrating “The Art of Giving”, this year’s Hope Street Margolis Family Center Champions for Children Luncheon raised over $380,000 for our After-school, Summer of Science, and health and wellness programs. More than 300 generous friends and supporters attended the February 22nd event, which honored Jonathan Club for its spirit of service, volunteerism, philanthropy and deep commitment to the Los Angeles community. 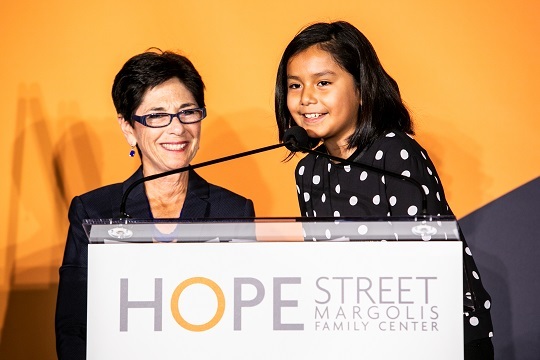 Hope Street’s Champions for Children event co-chairs, Eloise Appel, and Linda Ellman, created a heartfelt program featuring three youth, Genesis Marquez, Meri Jimenez, and Jonathan Perez. These dynamic children spoke about how Hope Street has changed their lives. This year’s theme was inspired by a service project led by After-school students who realize that although they might not have much, there are many in their community who have even less. The youth decided that they wanted to “give back” by distributing shoes and socks to people who are homeless. Bombas, a company with a social mission to donate one pair of socks for every pair sold, provided 1,000 PAIRS OF SOCKS to support their efforts. The luncheon’s “Giving Back” video featured youth delivering the socks to local Hope Street partner, St. Francis Center, and allowed attendees to see our youth’s enormous generosity. Guests were also treated to a video of our “Summer of Science” program which aims to inspire interest in and increase accessibility to STEAM (Science, Technology, Engineering, Arts and Math) subjects through hands-on experiments, interactive presentations, and field trips. Hope Street would like to thank and extend a BIG THANK YOU to the Fund Development Committee who worked tirelessly to make the luncheon a success. The Max H. Gluck Foundation has awarded a $50,000 grant to support Hope Street’s award-winning After-school Program, which annually serves 200 youth aged 8-18 at its Hope Street Margolis Family Center site. The program provides academic support/homework lab, work-study opportunities, sports and recreation, music, arts, and cultural enrichment activities six days a week, including during the summer months. Our 8-week “Summer of Science” program immerses youth in STEAM (Science, Technology, Engineering, Arts and Math) subjects through hands-on, project-based learning and weekly field trips. Hope Street’s After-school program services are linked to critical mental health, health, and social supports that strengthens children and families and reinforces positive behaviors to equip our youth to succeed in school and beyond. We are grateful to The Max H. Gluck Foundation for its support and investment in the futures of our incredible youth. If you’d like to visit or volunteer with our After-school Program, please contact Sarah Winfrey, Development Officer at 213.742.5869 or Sarah.Winfrey@DignityHealth.org. Hope Street was honored to host the director of the Office of Head Start, Dr. Deborah Bergeron--or Dr. B. as she likes to be known- -on February 28th. Hope Street’s Early Head Start program was selected for this special visit because of our strong outcomes; comprehensive scope and services; unique partnerships; and healthcare affiliation. Dr. Bergeron and colleagues Jan Len and Cynthia, toured Hope Street Margolis Family Center, played with toddlers in our child development center and met with parents enrolled in our Early Head Start Family Literacy program. Parents shared how the program has helped them improve their English language skills and support their children’s early learning and development. The visit concluded with a discussion with parents, staff and Dignity Health leaders. Established in 1997 as a collaboration between California Hospital Medical Center and UCLA, Hope Street’s Early Head Start program provides a continuum of early care and education, health and nutrition, mental health, and social services that support young children and their families. Foundation members just like you help to make a difference every day. 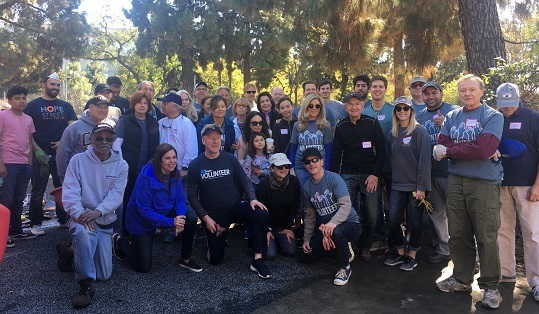 On Saturday, February 23rd, Jonathan Club members participated in a service day at Hope Street’s soon to be developed child care center located at St. Mark’s Church in South Los Angeles. Once fully renovated, the center will provide critically needed, high-quality child care to 32 low-income children 0-3. Our new site will provide early childhood education, link families to resources, and enable parents to work or pursue education or other career training opportunities. More than 30 Jonathan Club volunteers generously donated their time to remove old flooring, fences and plant overgrowth, and made soft fleece blankets for Hope Street families. Work that Jonathan Club volunteers did at the new site saved Hope Street hours of time and money and removed enough material to fill three large dumpsters. We are grateful for our partnership with Jonathan Club and its volunteers which support Hope Street days of service, cooking classes, beach days, and more. A couple of ways that you can support Hope Street is through Ralphs Community Rewards and AmazonSmile. Both programs donate a percentage of sales from purchases made at Ralphs stores or online at Smile.Amazon.com. Enrolling in the Ralphs Community Rewards Program is easy! Register your Ralphs Rewards card, if you have not done so. Under “My Account” click on “Community Rewards” and type in “California Hospital Medical Center Foundation” and click to enroll. Hope Street will receive donations through California Hospital Medical Center Foundation’s account. To participate in AmazonSmile visit Smile.Amazon.com and log in with your Amazon user name and password. Then, go to “Your Account” from the top of the navigation page and select the option to “Change your Charity” and type in “California Hospital Medical Center Foundation” and click on “Select”. This enrolls you into the program and designates Hope Street through California Hospital Medical Center Foundation as your non-profit of choice.